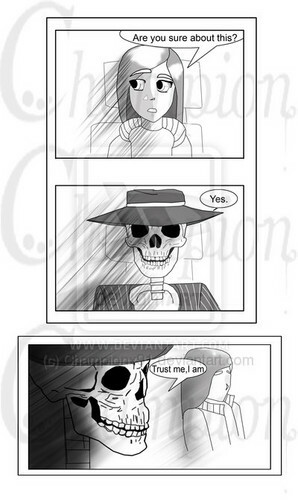 Skulduggery comic pg1:complete:. . Wallpaper and background images in the Skulduggery Pleasant club tagged: skulduggery comic pg1:complete: skulduggery pleasant awesome funny fanart valkyrie. This Skulduggery Pleasant fan art might contain gafas de sol, gafas oscuras, sombras, tonos, signo, cartel, texto, pizarra, and letrero.